The Antitrust Revolution, Seventh Edition, provides an unparalleled view of antitrust in the 21st century. The Antitrust Revolution, Seventh Edition, examines the critical and ever-changing role of economics in the antitrust process in the US. The book consists of 22 case studies of the most significant antitrust cases of recent years, building on previous editions that have chronicled the growing role of economics in antitrust since 1989. This edition includes 17 entirely new cases that demonstrate the novel economic issues that continue to arise and the new roles for economics in the process. Commissioned and edited by Professor Lawrence J. 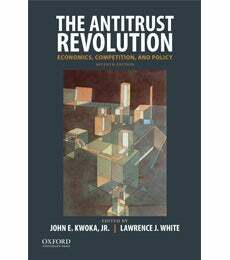 White and John E. Kwoka, Jr., all of the cases included in The Antitrust Revolution, Seventh Edition, are written by prominent economists who have been directly involved in the proceedings. These economists were responsible for formulating the economic issues, undertaking the necessary research and, in many cases, presenting the arguments in court. As a result, they are uniquely qualified to describe the cases and demonstrate their significance. Together with a new introduction, four new essays introducing the topics covered by the book and new technical appendices to some cases, The Antitrust Revolution, Seventh Edition, provides an unparalleled view of antitrust in the 21st century. To learn more, visit the Oxford University Press website.